Pegan diet arose from a cluster of two diets: paleo and veganism. Something is not right here! After all, the paleo diet is full of meat, and veganism excludes animal products. It is as if from both modes of nutrition to take what is the most important, combine the other assumptions and sell such a diet under a new name. The author of the pegan diet is Mark Hyman, a medical doctor who has been propagating his own diet since 2014. However, only now the Internet has gone crazy about it. Its assumption was to choose and combine the best aspects of the paleo and vegan diet. 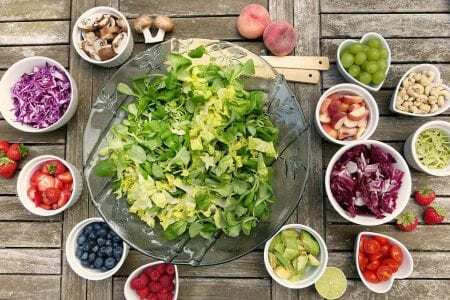 What characterizes pegan diet? Low glycemic index of the diet – low content of sugar, flour, purified carbohydrates. High content of vegetables and fruits – a large variety of colorful vegetables and fruits. Low content of pesticides, antibiotics and hormones from food products. High content of healthy fat – mainly unsaturated omega 3 from nuts, seeds and avocado. It sounds beautiful! The problem arises when we look more closely at its specific rules. Vegetables and fruits – they should account for 75% of everything you eat during the day. Choose those with a low glycemic index. Add 2-3 vegetables to each main meal. Gluten-free cereals (rice, quinoa, amaranth, buckwheat) – allowed once in a while, but they can cause fluctuations in blood sugar and exacerbate autoimmune diseases. Legume seeds – the best is lentils. Avoid beans and broad beans! Meat – treat only as an addition to the dish, not as the main ingredient. What can you not eat using pegan diet? Pegan diet is therefore neither paleo nor vegan. This is a diet that is based primarily on products of vegetable origin, mainly vegetables (75%), which you supplement with a small amount of nuts, seeds, gluten-free cereals and animal products. It is less restrictive than the paleo diet and easier to use in practice. The diet ensures adequate supply of dietary fiber. This is a diet based on unprocessed food products. Pegan diet is characterized by low intake of salt and sugar. Pegan diet provides too little carbohydrates, which may result in weakness. There is a risk that the pegan diet does not ensure adequate consumption of protein and vitamins from the group B. You can feel a stronger hunger on a Pegan diet. The use of this method of nutrition is quite expensive, because the diet is based on organic products.